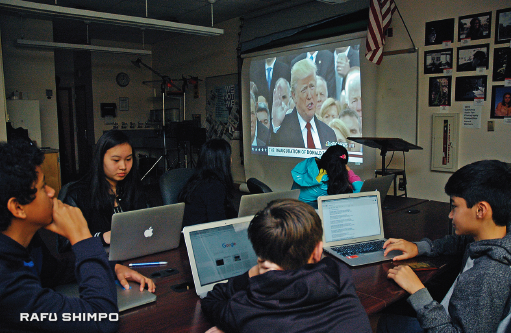 SOUTH PASADENA — None of them are yet old enough to vote, but the students in the first-period journalism class at South Pasadena High School were nonetheless intently watching the Jan. 20 inauguration of Donald J. Trump as the 45th president of the United States. Instructor Mike Hogan had the live television feed projected on a large screen while several students followed the events in Washington online. These are truly 21st-century students, who consume mass quantities of information; one student was keeping an eye on the TV broadcast while looking over related searches on a laptop computer and posting messages via his phone. South Pasadena as a community tends to lean liberally Democratic, and the opinions of the students in this particular class were no exception, but as journalism students, they were doing their best to view the events of the day with an unbiased eye. Though she said she wasn’t much of a presidential history buff, Jean Lih made several references to past commanders-in-chief. She said she disagreed with many of the statements Trump has delivered during the campaign as well as his inaugural speech, but that other presidents have displayed questionable behavior. When a light rain began to fall during Trump’s speech, Lih mentioned how William Henry Harrison had refused to wear a hat and overcoat during his two hours-plus address in a freezing rain in 1841. He developed pneumonia and was dead 31 days later. Two of Lih’s classmates were active volunteers at the local Democratic headquarters, working to help Hillary Clinton’s presidential campaign. Sporting a Planned Parenthood T-shirt, senior Hailey Bugg was not swayed by Trump’s inaugural address. “Nothing in it was new or shocking. It’s mostly the same things he said during the campaign, or the same things other presidents warn about,” she said. Bugg and fellow volunteer Laura Mancini planned to attend the Women’s March Los Angeles, set for a downtown start on the morning of Jan. 21. Mancini and her family immigrated from Brazil, and she has felt personally touched by much of Trump’s rhetoric. “He really says offensive things about immigrants, and that’s something that really hurts me and people like me,” she explained. Sophomore Eva Cabbell’s initial reaction when asked about Trump taking the oath of office was a simple thumbs-down. “I don’t understand, after all the terrible things he has said — about women, minorities, all the people he offended — and he still got elected,” Cabbell said. Hana Tyszka, a senior who stopped by the classroom during the passing period, called Trump’s victory surprising and said it demonstrates the importance of fulfilling the duty to vote.